Chose the speakers carefully that go with it . Take the amp to the shop with you. I have owned this splendid amp for a couple of years now. When I bought it we also had a NAD 340. I preferred the NAD sound at the time. Took me a long time to appreciate this Amp. I run it with a cambridge 640 azure CD player with atlas connectors I always swap my speakers around. I have Tannoy m3 on at the moment. gale speaker wire. I think it sounds superb. No complaints. The amp Quite likes the B&W 302 as well. One thing the review says 40 watts RMS the book of words that come with the amp are 55 watts RMS into 8 ohm. I paid £250 for it brand new in my local hi fi shop. The upgrade path always brings problems. I "upgraded" my Arcam 8R to a Maranz PM7200. The Marantz was very nice but not an upgrade. The Arcam really has that English sound. Tuneful, rich and slightly thick, subjectively pleasing but lower on tempo and detail. Waht to do? Running my Arcam 8R through Kef Q35.2 speakers and a NAD CD540 front end I was happy but wanted something more. At higher volumes the system lost control a little. After my futile adventure with the polite and powerful Maranz I wanted some action. Remembering a wonderful Musical Fidelity B1 I once owned I decided to go for A really discounted Musical Fidelity X-80 (£249). It sounded great straight from the box but unfortunately it's visceral and forward presentation added bass in droves and I realised my neighbors were going to suffer. I realised I had to treat this X-80 more like a pet than an amp. So again what to do. With little money I needed standamount speakers and goo ones too. Audition time. So I listened to some Wharfedale Diamond 9.1's in the shop with a Cyrus amp and the X-80. Shocked by how good they sounded I bought them. At home my whole system opened up and as I ran in the amp and the speakers I realised I really was upgrading. Of course the bug was there and I wanted to upgrade my CD player. Good Cd players cost though. I'd seen some reviews for the Cambridge Audio Azur 640C. Really good reviews. Very good reviews. so chancing my arm I went and bought one. Bingo!!! The biggest clearest upgrade I'd made. 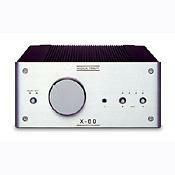 The X--80 though is a very visceral and forward sound. Detail, speed, rhythm, articulation and soundstage are it's forte. The Cyrus is slightly more detailed and articulate but the X-80 bass is way better. Speaker mathching is ESSENTIAL with the X-80 though or you'll get an ASBO on you. It is musical and has a great tone. It needs a long time to run in. It runs cool so you can leave it on all the time. If you like a fairly fast amp that has superb separation and deatil go for this. Musical Fidelity are geniuses. Some prefer their warmer A clqass amps but I like their faster and more dynamic B class ones. This is a GREAT amp. Musical Fidelity B1 Arcam 8R Maranz PM7200 The MF X-80 is by far better. Produces a big, dynamic, beautiful, detailed audiophile sound full of harmonic richness and subtlety that keeps you transfixed, listening and listening. Elegant and sturdy half-box minimalist construction. Runs very very cool. And the snazzy blue LEDs look great on the buffed steel fascia. Temperamental motorised potentiometer is a real diva and needs to be spanked. I had been planning to buy a new amplifier for weeks, but this Musical Fidelity X-80 integrated did not even feature on my shortlist until the very day I bought it! I had been oscillating for months between an Exposure Titanium integrated (2010 or 3010) and a Cyrus (6VS or 8VS). I had not given Musical Fidelity's amps any thought because of my previous experiences listening to my brother's MF X-A1. I found the X-A1 too cloyingly sweet and over-warmed. Professional reviews had touted its supposed dynamic ability, but I was greatly amused to discover that it could not drive my brother's little Tannoy Mercury MX2.5s to reasonably loud levels without suffocating! The MX2.5s strangled the life out of the X-A1 at volumes above 10 o'clock. This poor performance lowered my expectations of MF amps as credible contenders for my money. I like dynamic amps. Also my fingers receive a slight electrical tinge each time I handled the X-A1's metal volume knob. The X-A1's replacement X-A2 was on my shortlist when I shopped for my own amplifier. Although it was more powerful, there was a noticeable lacklustre quality to its sound. It sounded grayer than the colour of the stunning NAD C370 I bought instead. Thus, when I gave the X-80 a quick listen in the store, I was pleasantly taken aback to hear the noticeable sonic departure MF has made from the safe, boring sound of the X-A1, X-A2, and even the A3 series. The X-80 is a great step forward for MF. While its midband performance retains that unmistakably detailed delicacy and lusciousness one associates with the MF sound, it discards the coloured warmness and treacly slowness of the older MF amps. Although rated a mere 55W, the X-80 is a very dynamic and powerful performer, sounding far bigger, more vibrant, more tonally varied, and more musically realistic than my two previous amps the NAD C370 and Marantz PM7200 (120W and 105W respectively). Whatever music you put through it is reproduced with such vibrancy, harmonic richness, and quicksilver dynamics - it amazes. Of course the C370 and PM7200 both go subjectively louder, but the X-80 _sounds_ bigger in comparison thanks to its abovementioned audiophile qualities. I do not miss the shortfall in RMS power at all. Also, the X-80 handles all genres of music so immaculately and faithfully, it's positively addictive. Orchestral music and opera sound true to life; rock, like rock; and jazz, jazz like it should be. To sum it up, I bought the X-80 because it combines most of the virtues of the Cyrus and Exposure amps I had shortlisted, with none of their vices. While the X-80's bass control is not as tight as the Cyrus 8VS, deep bass notes are still well-shaped, never flabby, and fine-detail retrieval is comparable too. The fleshier sound of the X-80 is also kinder to my thin-sounding 1960s, 1970s-era classical cds than the lean mean Cyrus. And while the X-80 cannot match the Exposure amps' immaculate rhythmic timing, roller-coaster dynamics and well-spaced soundstage, it remains a fast dynamic amp in its own right and throws a respectably airy and atmospheric soundstage. Plus, it has better focus and none of the Exposure amps' slight mistiness. If you do not require that much power and do not listen to vinyl, the X-80 may be a better value buy than the X-150(80W). It has more than enough omphh to fill a normal sized living room with sound, and has one more line input than the X-150. Although the X-150's vault-like volume knob is very fancy, I personally prefer the X-80's bigger, thicker, unetched plain steel knob. More macho. The only flaw of the X-80 is the motorised volume control. MF does not have a track record for fitting excellent motorised potentiometers at all. If you keep pressing the Vol buttons repeatedly on the remote just to play with your X-80, the motor will assert its autonomy and keep rotating the knob down or up (non-stop!!!) even after you have taken your finger off the remote's buttons. You should tap the Vol buttons lightly to nudge the knob, and do so only very intermittently. Even then, the incremental shifts of the volume knob are not uniform and imprecise (Cyrus must be laughing away). If this bug really puts you off, you will need to consider buying a rival amp instead. For me it does not matter. I like the X-80's minimalist approach, and even if it weren't remote-controllable it would still be an audiophile bargain. Besides, you know, a person burns 1 calorie each time he reaches out to adjust the volume knob, and that reduces the chances of him turning into a couch-potato. With such a nice big steel knob on display, every X-80 owner really should be reaching out to handle it more anyway. I have stored away the remote and resorted to manual volume adjustment. Exposure 3010, 2010, Cyrus 8VS, 6VS and Audio Analogue Primo Settanta.